Joyleop Black Unicorn Case for iPhone 7 Plus 8 Plus,Cartoon Soft Silicone Cute 3D Fun Cover,Kawaii Unique Kids Girls Cases,Fashion Animal Character Skin,Gel Shockproof Shell iPhone 7G8G Plus + 5.5"
1.Perfectly Fit Those Pink Unicorn cases are perfectly for iPhone 8 Plus, iPhone 7 Plus. 2.High Quality Silicone Those cases are made from high quality of silicone with a nice rubber grip so no slipping.it will worth your penny and have mild smell. 3. Excellent Protection Provided Those cases will provide a all around protection to your phone, especially if you drop it from high place in accident, it 's like encasing your phone in foamy shock absober. 4. Precision-Cut Cutouts Perfectly align with all buttons, controls, and ports allowing easy. 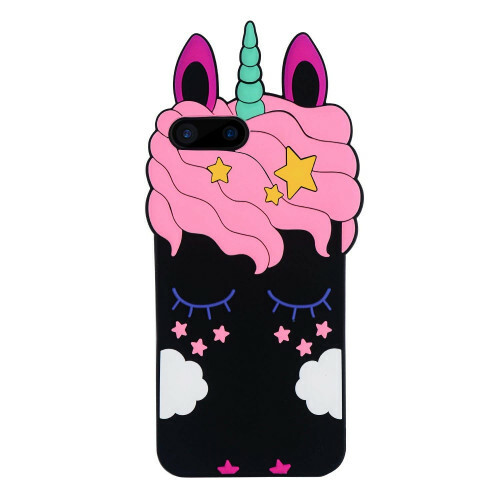 5.Super Cute Adorable Style Those iPhone 7/8 Plus cases are in a very unique,cute,adorable cartoon style. People will compliments your case everywhere. 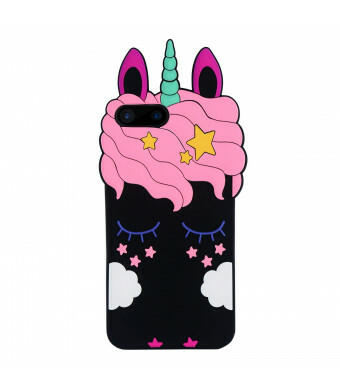 You will have a beautiful mood when using this phone case. This series cases are very useful for someone who have children, your kids can feel free to throw your phone when you using those case, it can provide perfectly shock proof to your phone. 1. Precisely fits the contour of your phone. 2. Soft silicone provide full body protection. 3. Simple, functionality, Practical and good price. There is nothing more important to us than our customer's concerns and support. Please feel free to contact us, we are willing to provide any help you may need at any time.